The present carving of the leaping makara is rendered with great vigour. The carver has deliberately taken advantage of the rich colours of the stone, contrasting the dark russet of the waves with the brightness of the upper body of the carp as it leaps up from the water. According to Buddhist legend, the makara was originally a whale that saved the lives of five hundred drowning merchants at sea, and then sacrificed itself by providing its own body for food to feed the victims. Because of its compassion and sacrifice, both important virtues in Buddhist philosophy, the whale was then immortalised and transformed into a makara, characterised by the head of a dragon, the body of a whale with wings and a pearl by its side. The subject-matter is visually very similar to that of the carp reaching the upper courses of the Yellow River and leaping up the rapids at Dragon Gate where it transforms into a dragon. This feat is compared to success in the state examinations and the transformation from carp to dragon symbolising promotion to the position of official. 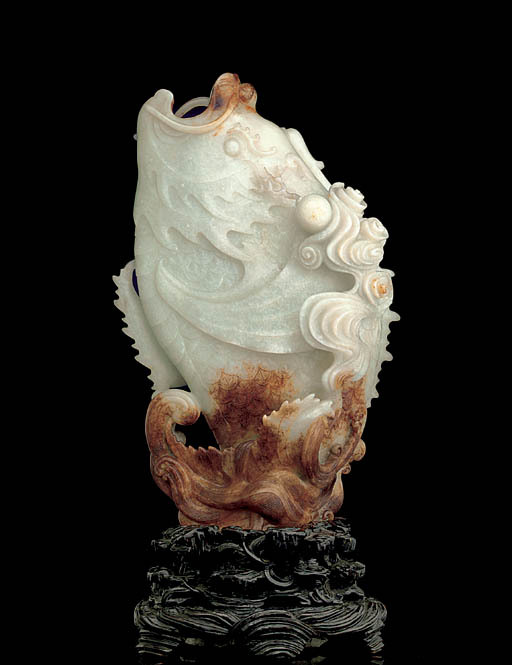 This was a popular subject on carved jadeware for its drama and auspicious representations, and several jade carvings, closely related to the present lot, but representing the leaping carp, are known, such as the example illustrated in Masterworks of Chinese Jade in the National Palace Museum, Taiwan, 1970, pl. 25.